A recent planned visit to my sister’s place in Norfolk led to an unplanned visit to a fine outlet for interesting, and sometimes fairly alternative, tipples. 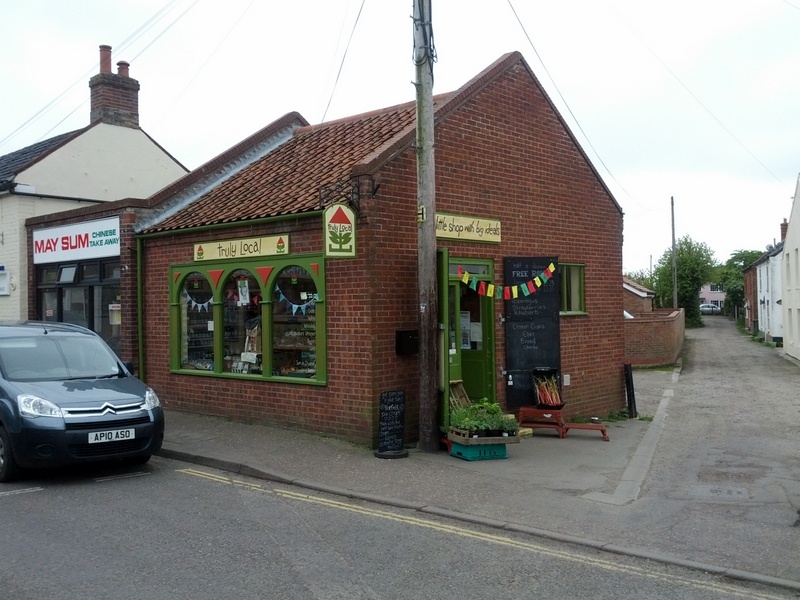 Truly Local in Stalham in north east Norfolk – only a few miles from the drowning village of Happisburgh – has already found a modicum of fame through the patronage of Prince Charles who made an impromptu visit to the 15 month-old shop in February. It would be wrong to describe Truly Local – which is run as a not-for-profit business – as a specialist drinks outlet, however. The shop sells local produce of many kinds sourced from within a 35 mile radius of the shop (which in practice means that half its catchment area is actually underwater – still there’s nothing to stop seafood being part of the offering!). Shop manager Mick Sims explained that while the 35 mile radius might seem arbitrary it was in fact a cunning ploy to enable the shop to sell whiskies from the The English Whisky Co. Ltd.’s St. George’s Distillery in Roudham. Not that Truly Local needs the products of England’s first purpose-built whisky distillery for a century to make it worth a visit for the intrepid tippler. 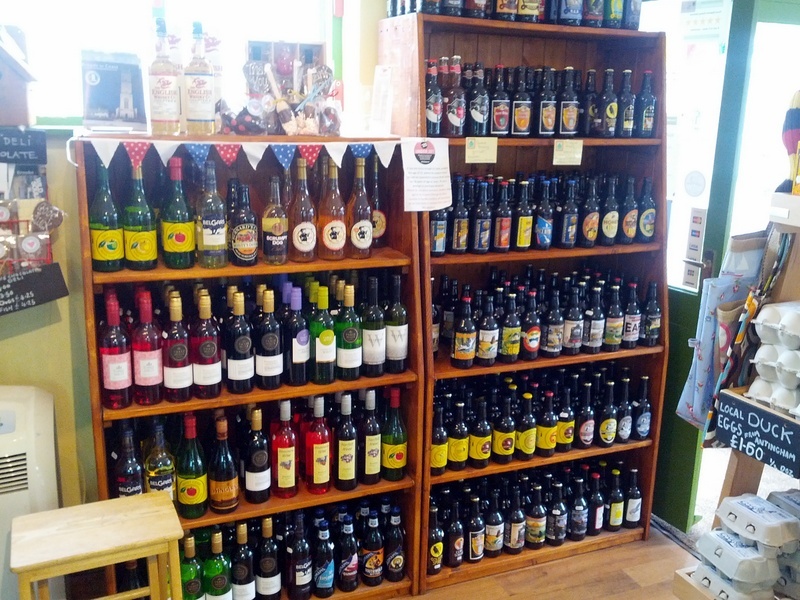 Also on offer was a wide range of beers from north Norfolk’s thriving brewing scene, ciders from a number of local producers, and a wide range “country wines”. With limited opportunity to consume any purchases in one night at my sister’s place and with only a small backpack with which to carry anything home (I’d taken the train from work the evening before to save both time and stress, although “problems on the line” put paid to any gains I’d made in time over driving) I had to select my weapons tactically. The tempting array of local beers included specimens from Norfolk mainstays Woodforde’s, Humpty Dumpty and Iceni, as well as various others. I settled for 500ml bottles of Chocolate Nutter (5.5%) from The Why Not Brewery in Norwich and a Double W IPA (7.4%) from Humpty Dumpty Brewery in Reedham for supping that evening. I also acquired a 750ml stoppered bottle of Red Herring Smoked Ale from Green Jack Brewing Company from Lowestoft in neighbouring Suffolk (but well within the shop’s 35 mile catchment area) whose Trawlerboys Best Bitter (4.6%) I’d been quaffing happily the night before in the convivial The Star Inn pub in Lessingham, not far from Stalham. My re-kindled love of cider saw me pick up two variations on the theme from the excellent Crone’s Organic Cider of Keninghall, the regular Old Norfolk and the Special Reserve (both 7.5%), plus a bottle of Medium Cider (7.0%) from the Norfolk Square Brewery near Great Yarmouth. I also found room for a bottle of Norfolk Mead (12.5%) from Broadlands Wineries with the intention of cracking that one open once I was home. Throw in a Camembert-style Copys Cloud from Mrs Temple’s Cheese in Wighton, a tasty Chilli & Onion Sticky Relish from Chillis Galore in Norwich and some organic multi-grain bread rolls to soak up the booze and we had quite a haul. First up for sampling back at l’il sis’ place were the ciders, which she was keen to try. What can I say about Crone’s Old Norfolk other than it’s my new favourite cider! Well, at least it is until I try the Special Reserve which I expect will crank the experience up another notch. Much more West Country than East Anglian in style – it appears Crone’s does actually use genuine cider apples alongside cooking and eating apples – Old Norfolk offers an enticingly farmy, rustic experience, sharp yet full-bodied, tannic, cloudy and complex from extensive oak aging. Where Belgium’s lambic beers are sometimes described as “cidery” this was a cider that might well be described as “lambicky”. My sister really wasn’t sure about this one but I loved it. Maybe it was the moment but Crone’s delivered exactly what I’m currently looking for in a cider and is about as far away from mass-produced oversweet commercial cider as it’s possible to be. Although those producers undoubtedly have better websites (take note Crone’s!). The Norfolk Square Medium Cider, on the other hand, was clearly a product of eastern England, made exclusively from a blend of cookers and eaters. Less of a white wine facsimile than some similarly constructed ciders from further south in Kent that I’ve tried, the Norfolk Square Medium offered a distinctly appley but soft, even creamy, palate that was more acceptable to my sister but perhaps not challenging enough for myself. It was nevertheless enjoyable, however. Next up, the beers. Purely on the basis of strength I opted first for Why Not’s Chocolate Nutter. This one represented a bit of a risk for me, although one I gratefully accepted, as I haven’t always always enjoyed similarly-styled brews. Too often “chocolate beers” forsake adding dark cocoa notes through the sparing use of chocolate malt in favour of swamping the palate in Cadbury’s Bournville (or even Dairy Milk) flavours and textures, sometimes through the use of actual chocolate. I needn’t have worried about Chocolate Nutter, CAMRA’s champion bottled beer of Norfolk for 2011. The dark, stout-like beer (it’s not actually described as a stout) managed to integrate its chocolate flavours superbly within a gently roasted, nutty, malty framework. Very good. Why Not’s Double W IPA follows the American model for strong, hugely-hopped IPAs but varies from that template in being bottle-conditioned (most such brews are at least filtered, following the current “craft-brewing” trend so ended up delightfully yeasty, helping soften the three-way attack of Centennial, Simcoe and Challenger hops. The use of locally-grown toasty Maris Otter malt firmly anchors the beer in Britain, however, despite its influence. After the two powerful ciders and the dark arts of Chocolate Nutter, the 7.4% strength, heavy hopping and oversized 660ml bottle of Double W IPA soon brought on a hypnotic state leading to a restful sleep. 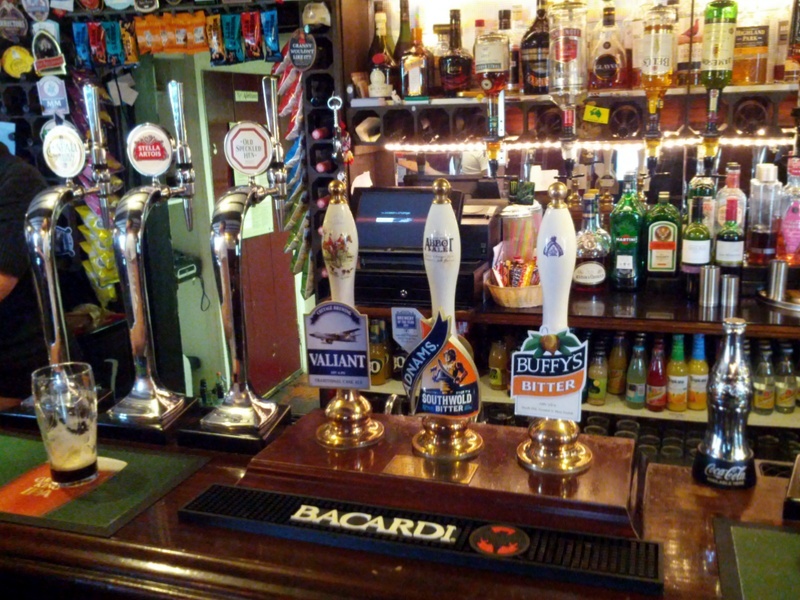 A lazy Sunday morning and spot of brunch at a local cafe was followed by a quick return visit to The Star – which yielded more Trawlerboys and a pint of Buffy’s Best Bitter, both good old-fashioned bitters, both excellent – before I headed home. I’ll report on the remaining bottles in my haul once I’ve had a chance to sample them.